Shakespeare and Einstein had some good sound bites but the true wordsmiths of our time are toddlers. Offering over 80 spots to jot down your little one's thoughts on puppies, rain, and world peace, this softcover booklet lets you both look back on their cutest observations and witty one-liners. Space for photos lets you put a sweet quote to a sweeter face. Handmade in Colorado. 8" L x 8" W x .5" H; 24 pages. Able to keep track of sweet things my kids say! Perfec gift for young parents. I think this is the perfect gift to help busy, young families slow down in the moments of life. It offers them a chance to redirect and refocus on what is truly important. My son loved this--it made all of his early childhood sayings, that I had written down and kept, into a keepsake. Gave this to my niece for birth of a baby and to others for their first Mothers' Day gift. Everyone loved it! Will buy and give more. Wish I would have had this when I had my children. GREAT GIFT IDEA FOR ANYONE WITH SMALL CHILDREN!!!! Gave this to my daughter ,a first grade school teacher who's always telling funny stories about things kids say in class. Thought it would be fun for her to write some of them down. Perfect gift for anyone with children. Wish I had had this when mine were small. Would have loved to have had a place to record those "priceless" expressions the kids would come up with. Difficult to see what this quote book actually is online. For the price, it was very disappointing. It's flimsy and poor quality. Online it looks like it is hardback covers. You need to describe this better and cut the price in half. 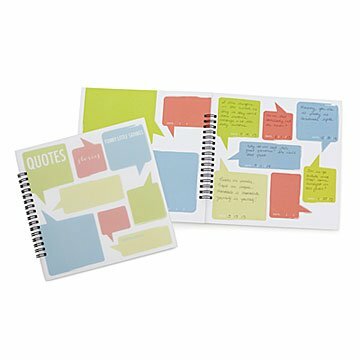 Remember your little one's funniest sayings with this quote book, offering space for photos and toddler -isms.